Finlux 32H8075-T review | What Hi-Fi? Smart features, a decent picture, a slim, attractive design and ample connections - all for just £200? Yes please. Last year, getting your hands on a smart TV for this giveaway price was merely a pipe dream. 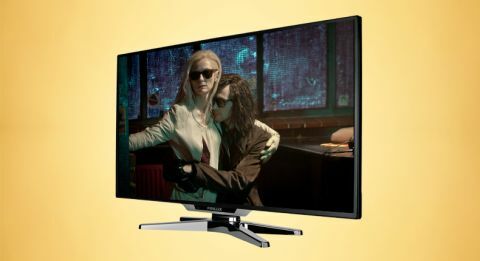 Now Finlux – which made quite a name for itself last year with its bargain TV deals – has slashed £80 off the price of its 32in entry screen. On paper, the spec has suffered for it; the TV losing the Full HD resolution (1920 x 1080) of last year’s models for an ‘HD Ready’ (1366 x 768) substitute. It doesn’t wave goodbye to Blu-rays or HD channels though: the screen simply crams (or, technically speaking, downscales) the higher-resolution content into the lower-res panel. How does it do? In short, great. It would be easy to pick faults with the Finlux’s performance against the leading 32in models, but bearing in mind it’s around half their price, it does well. Load the mildly futuristic romance Her on Blu-ray and, as well as producing a startlingly crisp picture, the Finlux complements the film’s aesthetic palette; the set’s rich, vibrant hues make the most of the pops of colour that appear against the backdrop of a largely pale-toned New York. Contrast is just as striking, too, with blacks inky deep, and whites clean and pure, although reaching that result takes some picture tweaking. Our only qualm is with the picture’s insight. At a cursory glance, detail seems fine, but colours could do with a touch more refinement and subtlety. Motion can trigger flicker, too. Though infrequent, it’s noticeable as the camera pans quickly down a tower block. Swap in Dirty Harry on DVD and the Finlux proves a good upscaler. Its well-defined image has precise lines and punchy colours, although background detail is sometimes lost in the shadows. Performance with broadcast TV shows the same traits, too. The Finlux’s sound is uninspiring, so you might find it pays to spend more for the better-sounding Panasonic TX-32AS500B, for example (£300). The Finlux sound will fill the room at high volumes, but it lacks detail and weight to get the most from a film - especially if it’s action packed. Featuring three HDMI and two USB inputs, as well as other legacy inputs such as scart), the Finlux isn’t stingy on connections. There’s a LAN socket, too, for a wired connection to a home network. To connect wirelessly, plug the supplied dongle into one of the screen’s USB inputs. Just as with many of its pricier rivals you can connect a USB hard drive, pause live broadcasts and record. We don’t take smart features for granted at this price, so are grateful for the commonplace BBC iPlayer, Netflix and YouTube apps, as well as music-streaming service Deezer and some handy news, weather and gaming apps. DLNA-compatible devices, like a smartphone or laptop, can also share content with the set when connected over the same network by using the appropriate software (an installation disc comes in the box). While the Finlux’s familiar interface is basic, using it is a breeze. The go-to page for online services is comprehensible, grid-formatted and usefully keeps the TV viewing screen in a preview box above tabs for Facebook and Twitter. The remote – used across Finlux’s 2014 range – measures over half the height of the TV itself! Netflix, YouTube and browser shortcuts are easy to spot, though, and the layout is easy enough to master. Meanwhile, the Finlux’s design belies its budget price, both smart and practical, while its four-legged stand means it will stay securely in place. While its shortcomings don’t go unnoticed (the absence of a fifth star sees to that) there’s no question of the Finlux’s cracking value for money. Got a £200 budget? Go for it.